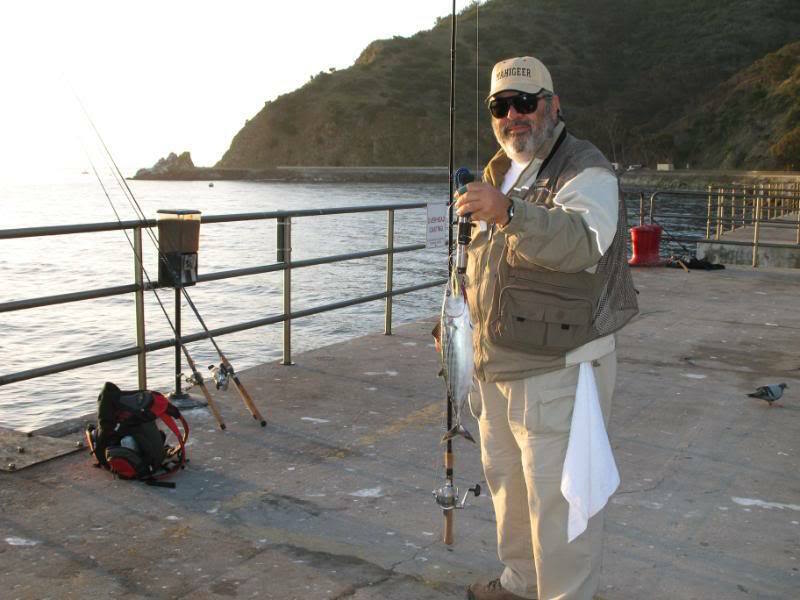 Posted by Mahigeer — Date: April 30, 2009 — The following report is about the trip, rather than the fish count. The trip preparation for me actually started a month before the event. I usually get all of my fishing gear out and go through them. Then I decide what to take and what to leave. 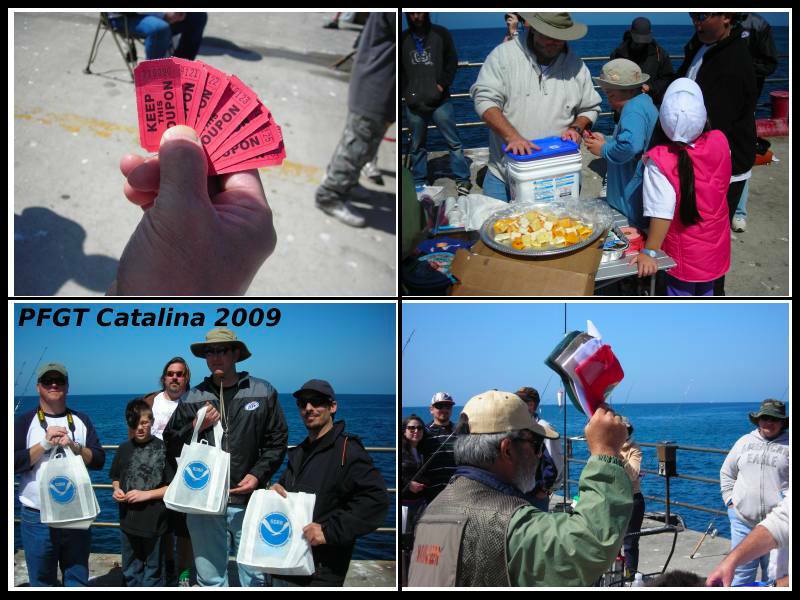 I had to get goodie bags from Marty Golden at NOAA, and get prizes from Bass Pro Shops etc. etc. Then over-pack as usual. This time I had to build a new cart as well, which worked fairly well. It needs some reinforcing for the next year. 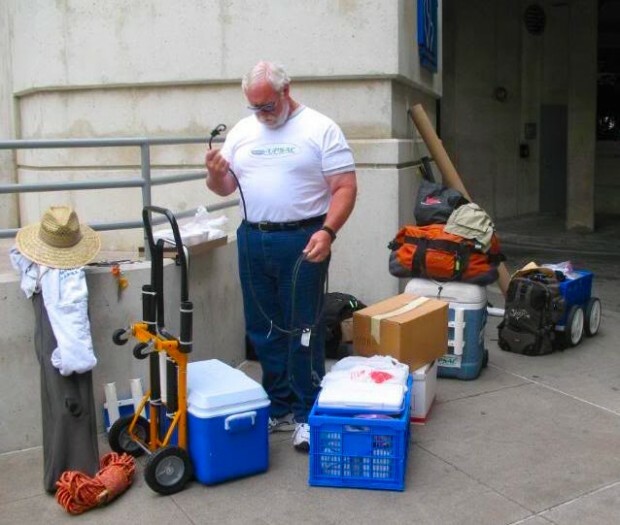 Wednesday April 22nd — Pre-trip —I had my roommate to be, Santa, drop his gear at my house so we could pack the car. This way we were able to leave early on Thursday morning. He also helped me rebuild my Penn reel. After sharing a light supper with Santa, and the Jones’s it was on to bed for an early rise and departure on Thursday. 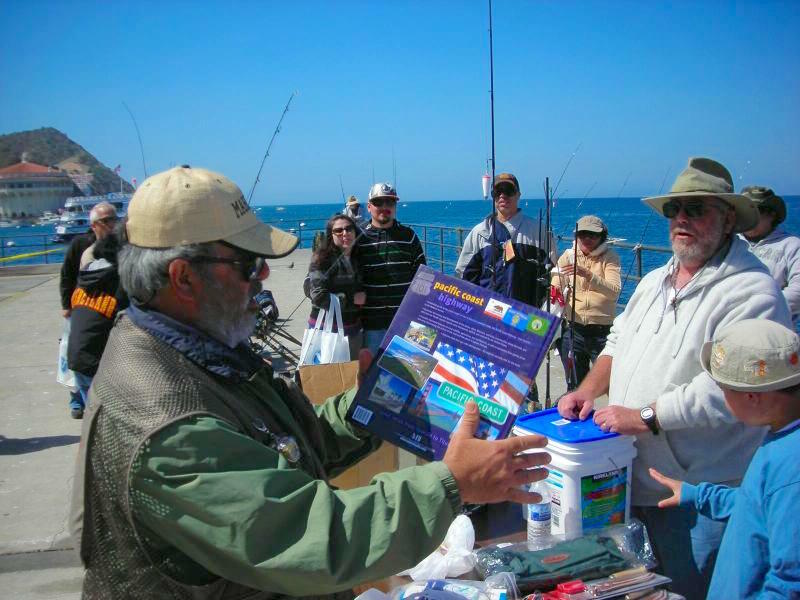 Thursday 23rd — The Trip — We (Santa and I) stopped at the Paul’s Bait and Tackle in San Pedro to pick up bait. They gave us $ 240.00 worth of bait free. 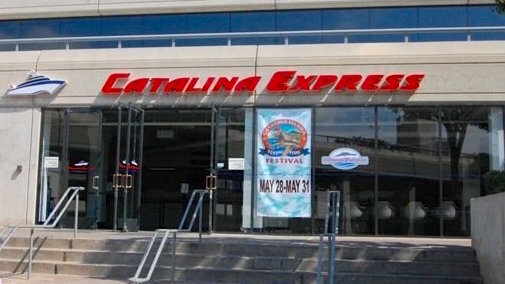 Next it was on to the Catalina Express Terminal where we found the Skipper and his wife Pat along with Rita and Kyle. 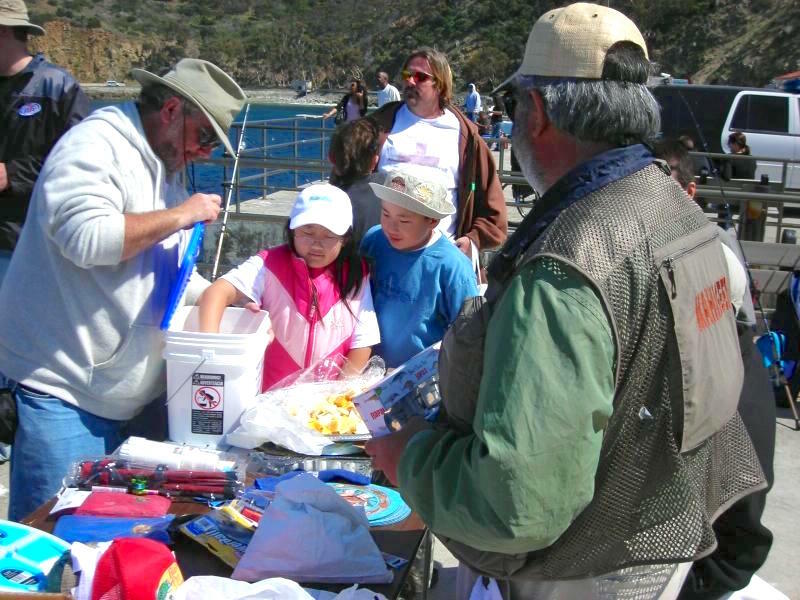 Catalina was having a special “flying fish” season so I took a picture of everyone wearing their flying fish hats. We went to the line to get on the boat. I was first in line, and Santa saw the attendee, giving a dirty look to my “four wheel” cart. To his amazement I pulled a couple of pins out and it met the requirement for a “two wheel” cart. On the way down the ramp to get on the boat, I did not see a protrusion, and the top heavy cart went flying. Fortunately Santa and Skipper helped me to upright the cart and Mrs. Jones took my clothing bag thus, reducing my load. We got on the boat and stored our gear at the stern of the boat. There was a clothing bag on top of this cart before the incident. I was proud of my cart and wondering if I looked liked a professional “pier rat”, but I was told by some visiting Floridians that I look like a homeless person with all of his possessions in tow!! I was relaxed and happy to be on board. I decided to take a look at the dock to see what was going on. I suddenly see my jacket and the rod holder tubes still on the dock. When the cart went over, I had put them down to work on the cart. Then I forgot to take them. 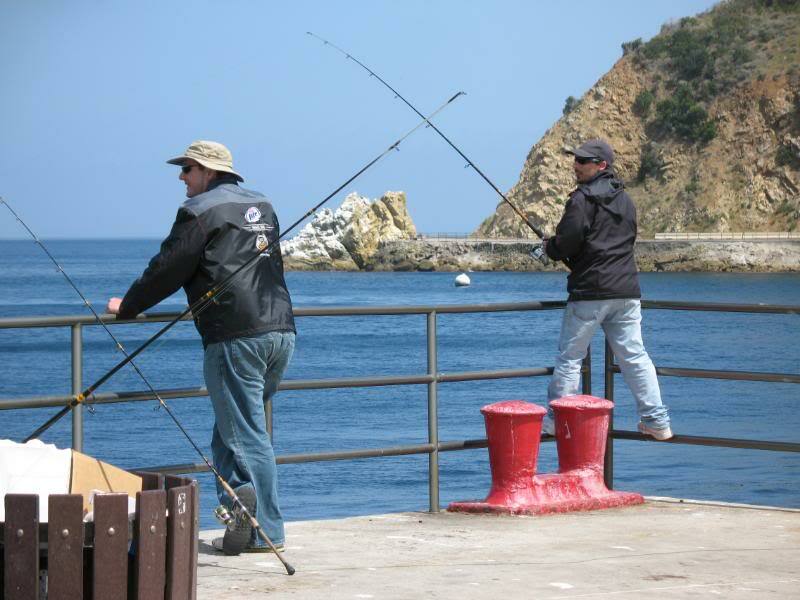 Fortunately the Captain was right there and he allowed me to go get my jacket and rods. The ride to the island was smooth for the most part. I took a pill and put on my wrist bands. This helped me recover, with no sea sickness. 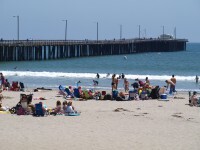 Upon arriving at the island, we decided to go to the Green Pleasure Pier (GPP). 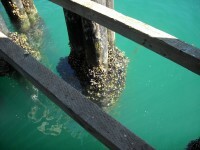 They had moved the floating dock and the ramp to one side, so there was plenty of railing space to fish from. One problem though, the entire back area was closed due to the construction going on. It happened that the man in charge was a “ham vatan” countryman in Farsi. 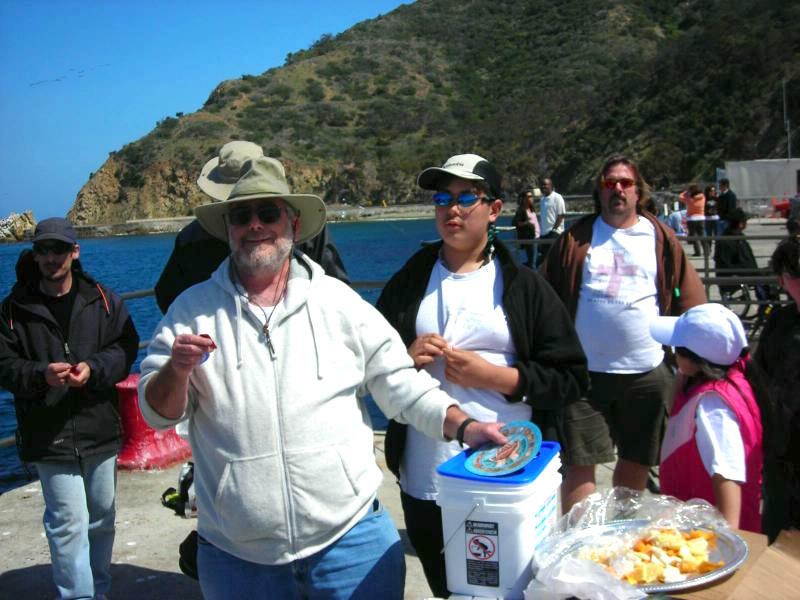 Whether because I made friends with him or Skipper talking to him or to the Harbor Patrol, they provided us with a place to fish from for the duration of the weekend. 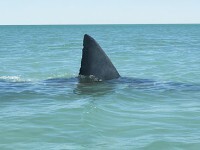 Good thing, otherwise the Skipper would have been unbearable to be with. 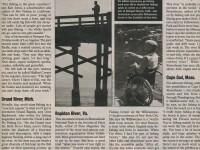 He looooves that pier. The hotel was nice enough to let us check in early and after unpacking and a quick lunch, Skipper, Rita, and Kyle, went to the GPP. Santa and I went to check the Descanso Beach, for a possible surffishing site. After we returned to the hotel, I went to the GPP, and Santa went to the Casino jetty. Kyle got some good-size opaleye and sheephead, Skipper got his usual variety, and I got some short bass and medium-size opaleye. We decided to meet later at Antonio’s with Gordo and Baitfish and family. I was the only one left at the pier when I saw the party of Gordo, and his guests arrive at the island. I used my small binoculars, and tried to wave at them. They waved back, but I am not sure if Gordo was waving one or five fingers!! After a nice dinner and conversation, everyone but me went to bed. I walked around with a powerful flashlight in hopes of seeing some thing, like a lobster, or flying fish. Friday 24th — Pre-event —I wanted to meet Adam at the Mole around 5:30 AM, but did not set the alarm correct. Around 6:20, while I am washing up, my cell phone goes off and there is a picture send by Adam holding a 2-1/2 lb. bonito, and smiling. As though he is saying “see what you are missing by sleeping.” By the time I got to the Mole he had caught and released four bonito. We fished till it was time to meet others at the Jack’s for breakfast. After breakfast, I had to take care of some organizing business and did not get to the Mole till afternoon. 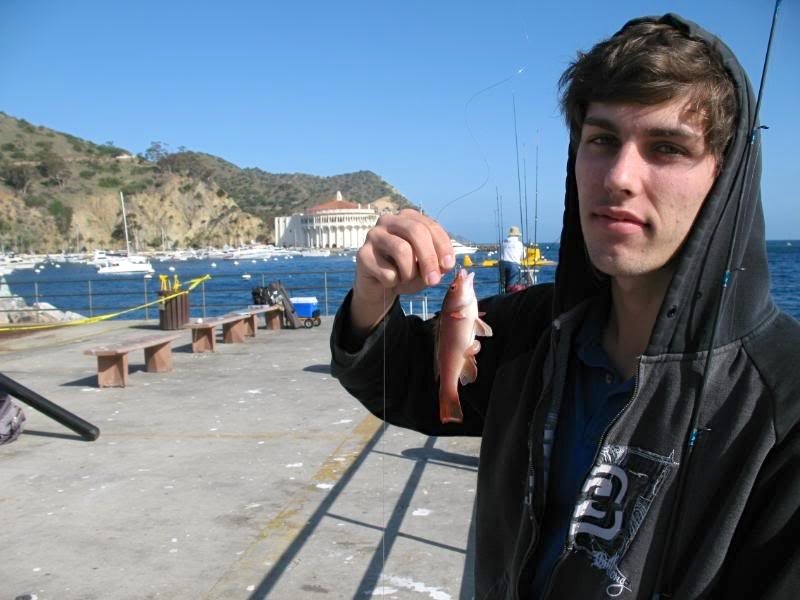 People started to show up and we fished the Mole. In the afternoon, some of the gang went to see the famous Tuna Club. 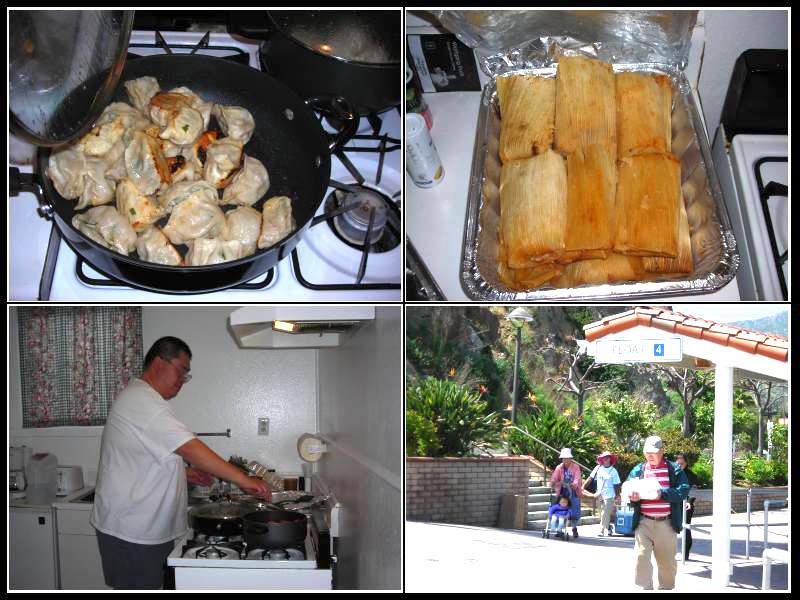 I fished till it was time to clean up for the dinner at the Mia Casita’s. After dinner I again went for a walk at the GPP, where I saw Minnow magnet getting fish after fish. Saturday 25th — the main event —I was at the Mole around 6:00 am, having set and worn my wristwatch, and having my cell phone next to my pillow in bed. The first bonito of this trip was landed around 6:30 or so. This time Adam was sleeping late. 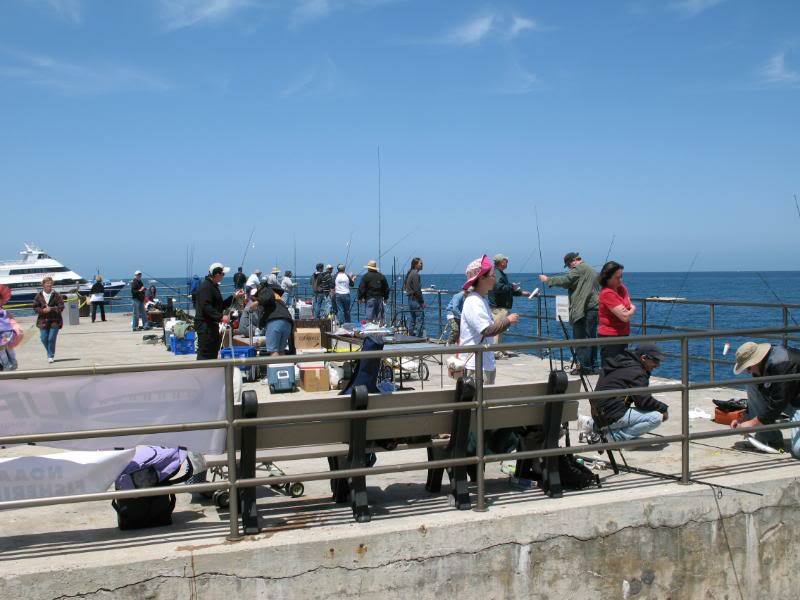 I fished till 9:00 am, at which time I went to the hotel to get all the necessary items for the “main event” By this time more and more people were arriving and setting up at the Mole. 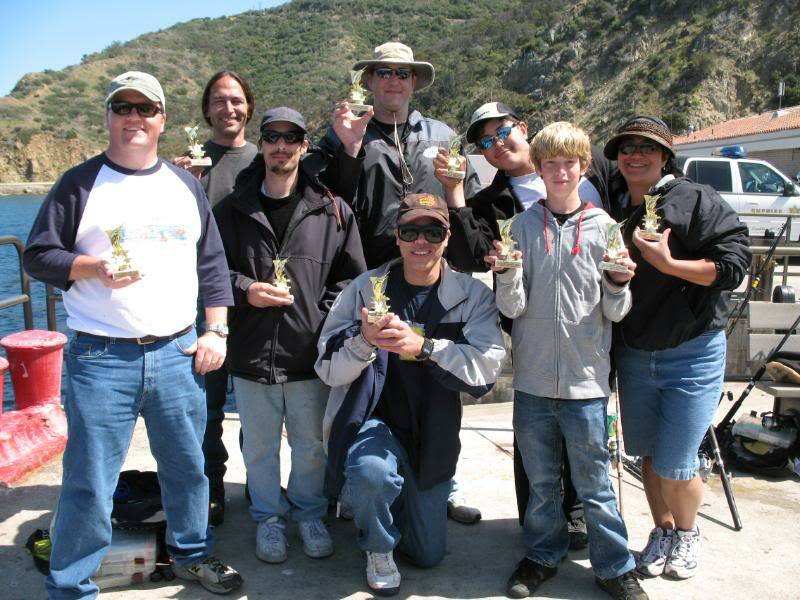 After the derby, lunch, raffle, and distribution of the trophies, we took a group picture and then everybody went back to fishing or packed up to go home. It was dark when we left the Mole to clean up at the hotel and meet for one more dinner at the Antonio’s. 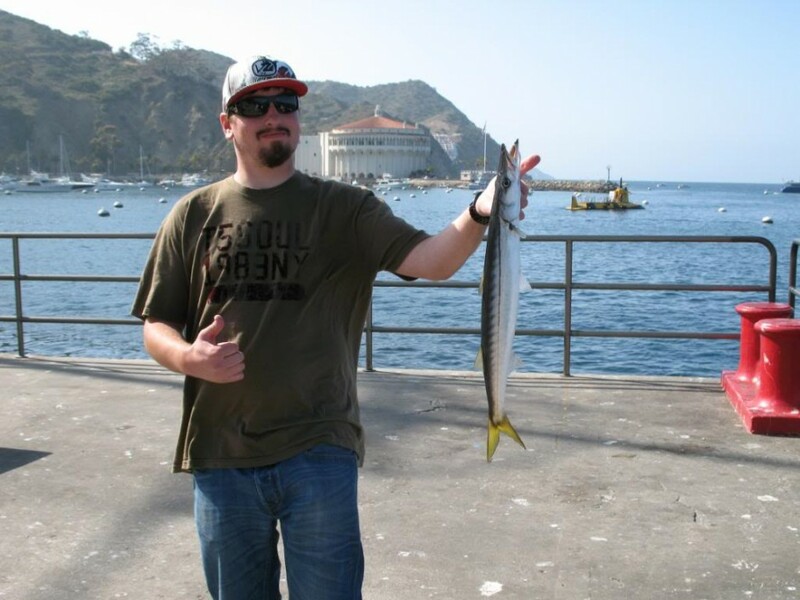 This time it was Baitfish and Rosterqueen, Santa, Gordo, SoCalNewb, and yours truly. We had a nice dinner and lots of laughs. After dinner I went for my after dinner walk, and checked the GPP. While there, Steve-O hooked in to something big. He will report on that I am sure. Day 4, Sunday 26th — The Saddest part of the trip! — After another breakfast at Jack’s we said good–by to each other, and went back to the hotel to pack and check out. Santa and I were on the 6:00 pm boat, so we went to the Mole, where we met Scooterfish and Steve-O. 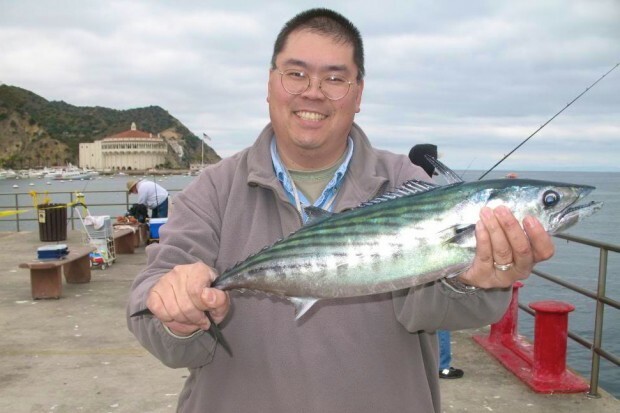 They were in their usual form of slaying bonito after bonito. 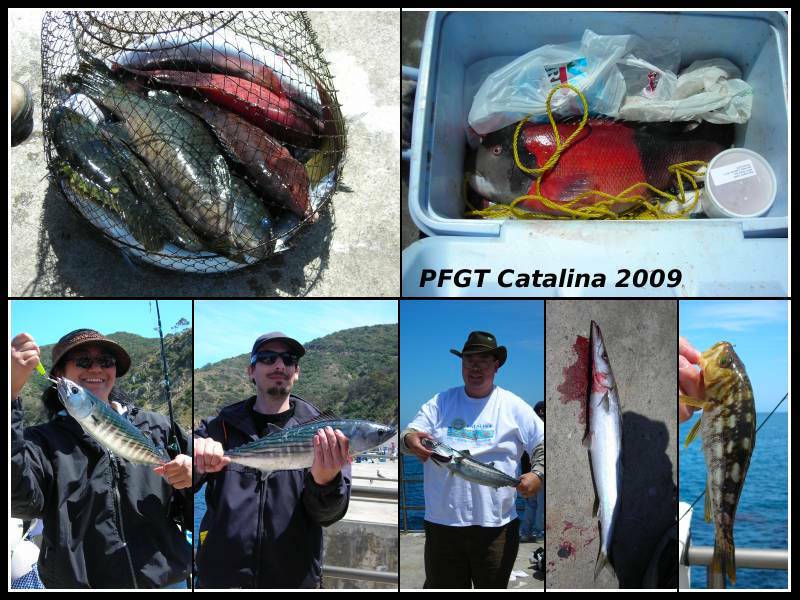 We fished and had tourist fish with our gear, re-organized our stuff and cooler full of fish, etc. 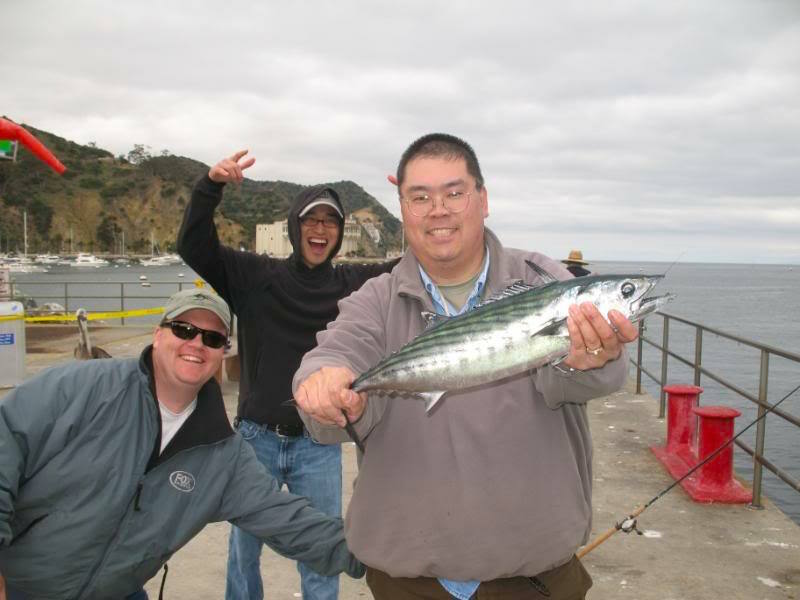 At one point while Santa was removing hook from a bonito, Scott, Steve, and I had a triple hook up on bonito. The ride home was smooth as silk with no problems except the weight of the cart. We arrived at the Long Beach Terminal to find my wife waiting patiently for us. As with all good things in life, this event had to have an end. That is the sad part. Now I/we start to count the days to the next one. Here are some side notes: I mainly bought the “wave cast” reel for this trip. It did not disappoint me. 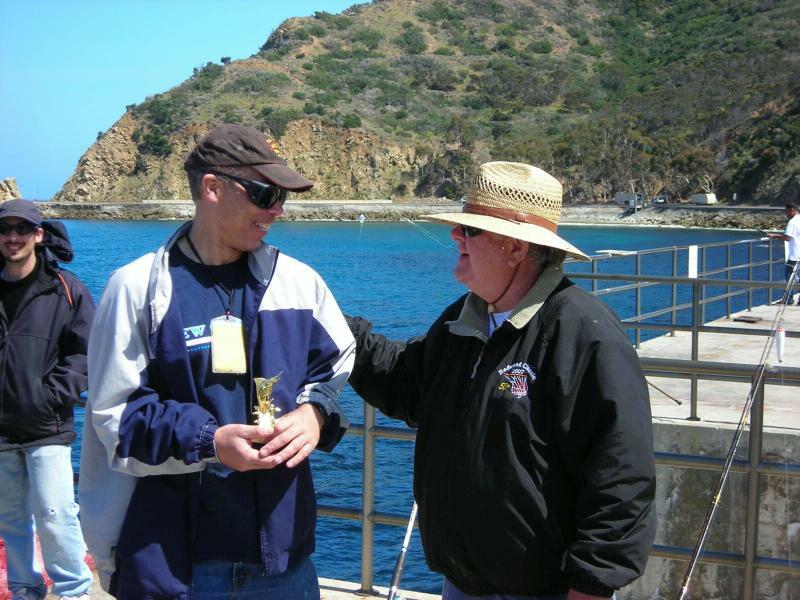 I even had veteran casters such as baitfish and Scooterfish, cast some with it. They seemed to like it too. It is not the ultimate reel by any chance, but it will do for me. While cleaning the bonito at my house, two of them had hooks in their throats. The 1/0 hooks are still in pretty good shape, with no sign of rust. 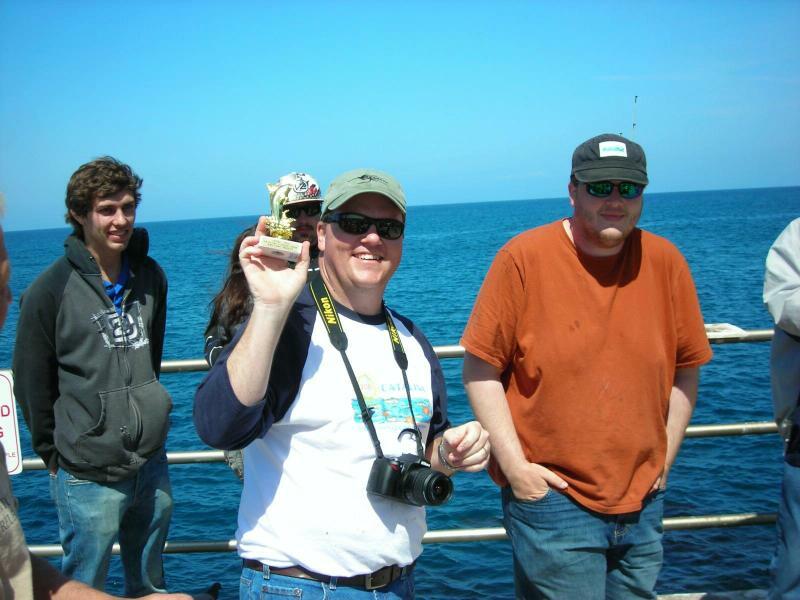 In Conclusion, I would like to thank Scott, Adam and Rebecca for coming such a long way to fish and visit with us. 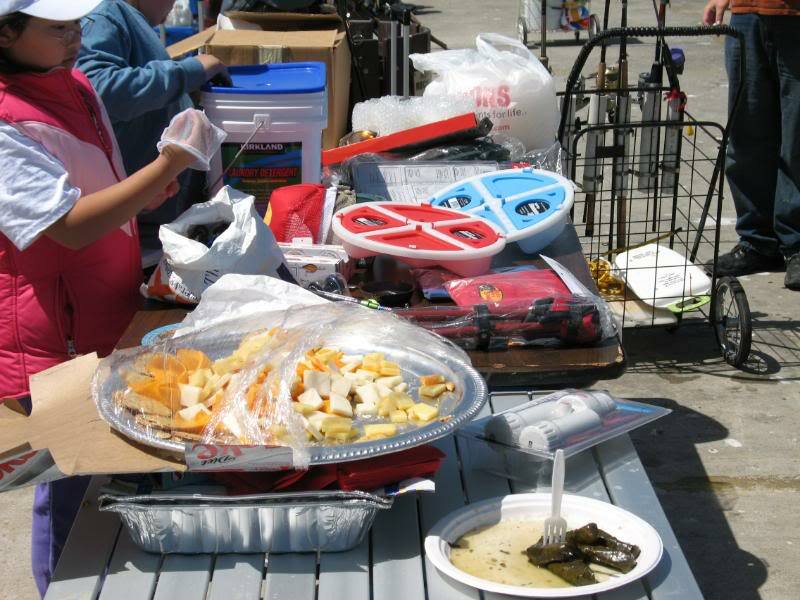 Thank you Gdude and family for the food, and the prizes donated. Thank you Gordo for collecting donation instead of fishing, and putting up with my singing! Thank you everyone who endured long drives and perhaps some monetary hardship to come join us and making this one of the best gatherings yet. Thank you to all who attended from far and near. 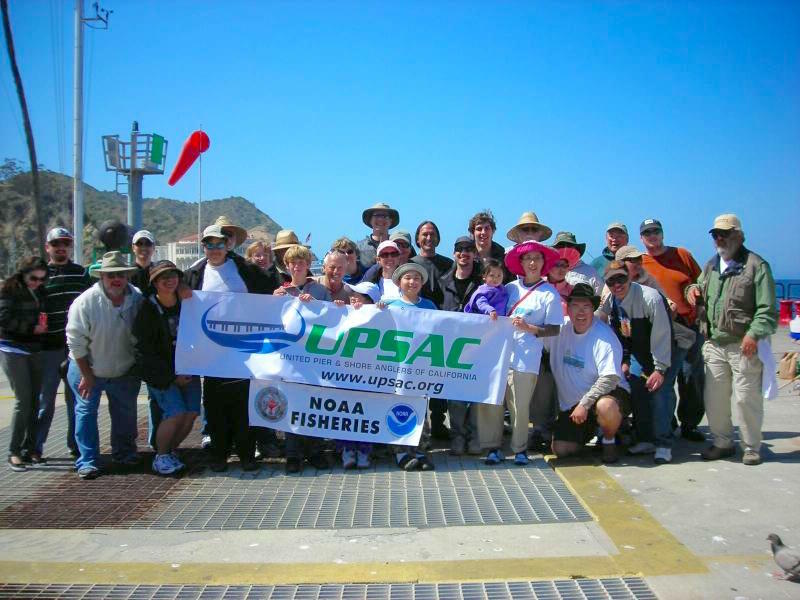 Without your participation it would have been just a fishing trip, rather than a Gathering. I left my house Friday morning at 5:00am CST, and arrived at Long Beach Airport at 12:55 PST. Steve-O was waiting for me after flying down from San Jose, and we grabbed our shuttle to Long Beach Downtown Terminal for the Cat Express. Upon arrival we noticed a fellow fisherman already waiting, which turned out to be SoCalNewb and his lady friend. Took our seats up in the Commodore Lounge, had a beer or two, and before we knew it we had pulled into the harbor at Avalon. Upon disembarking, the usual suspects were fishing the Mole… Quite a few Bonito had been caught just before we arrived, so we high-tailed it to the room, checked in, loaded Bonito gear and headed back to the Mole. 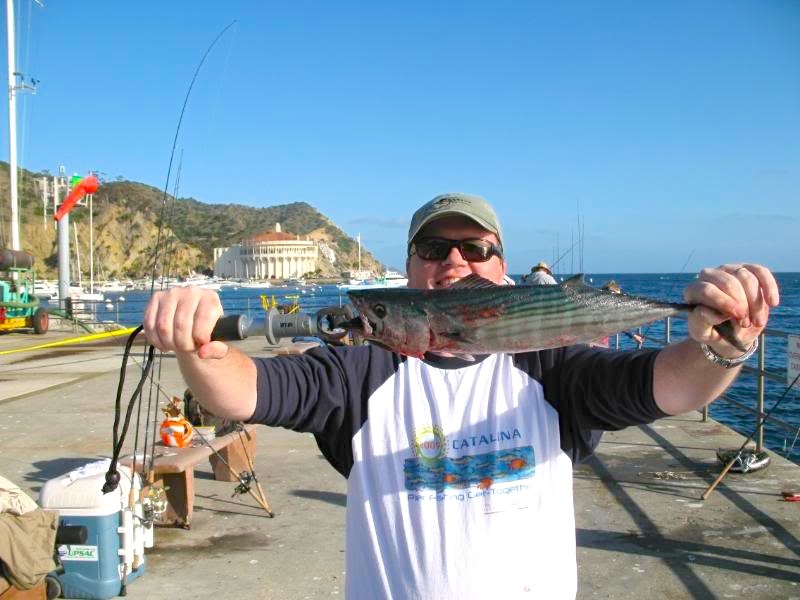 Fished for a couple of hours for nothing but jumbo mackerel before it was time to return to the room and then head over to the Mexican restaurant for dinner. Dinner was good, drank Raki in moderation washed down with a few beers, and then back to the hotel. Rigged up a pole with a Big Hammer and headed for the GPP for some nighttime Calico action. I managed a couple of legals and several dinks on artificials before calling it a night. Following morning (Saturday) I woke up at 4:45, loaded up and headed for the Mole to secure my favorite spot for the derby. Caught two nice bonito before the derby started at 10:30. Once the derby started, I got focused and really hammered the fish!! 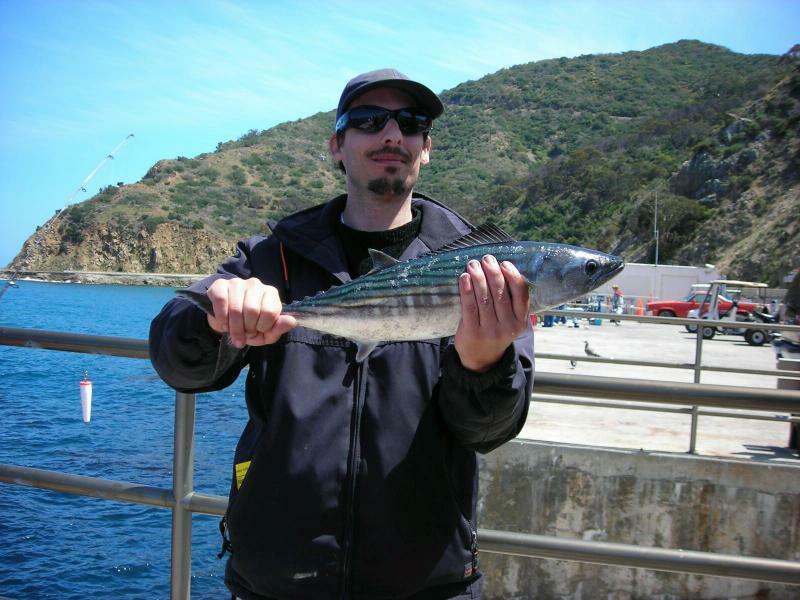 Most of the bonito were nice sized, with an occasional 5-6lb’r mixed in. Fish number 5 was a killer for me Sad I have fought and landed lots of fish on my G-Loomis, and this one was no different. I usually land these fish by reeling down until my rod is pointing straight down at the fish, then I pendulum swing the fish onto the Mole. 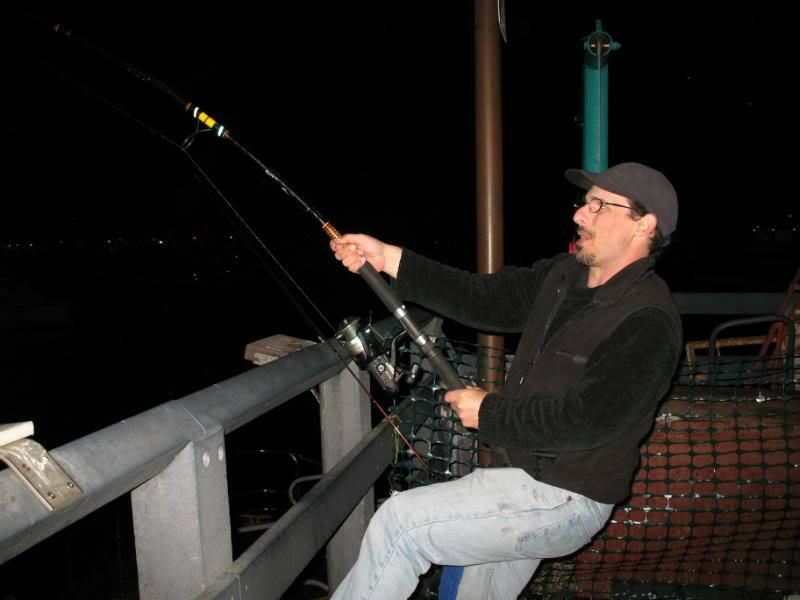 This was a slightly larger than average bonito and I did my standard swing landing with very little load on the rod (mostly on the line) but when I reached the apex, the top half of my rod just snapped loudly in two! I was bummed for a minute, but since it was the middle of the derby, I went to my backup rod (8.5’ G-dude special) immediately and kept catching fish. I landed 11 bonito during the derby, officially counting 10 towards my score. 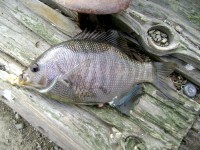 (One fish that was caught near the end of the derby was returned to the water before I could find someone to record it.) The Loomis will cost $50 to replace with the lifetime warranty. After the derby and raffle concluded, we headed back to the hotel for some R&R. Napped for a couple of hours, grabbed some dinner at Antonio’s, then grabbed our heavier gear and headed for the GPP to soak some bait. Using whole fresh squid we landed a couple of 10-12lb horn sharks, which is something like fighting a wet blanket… Pretty boring fish to catch, although cool to look at! 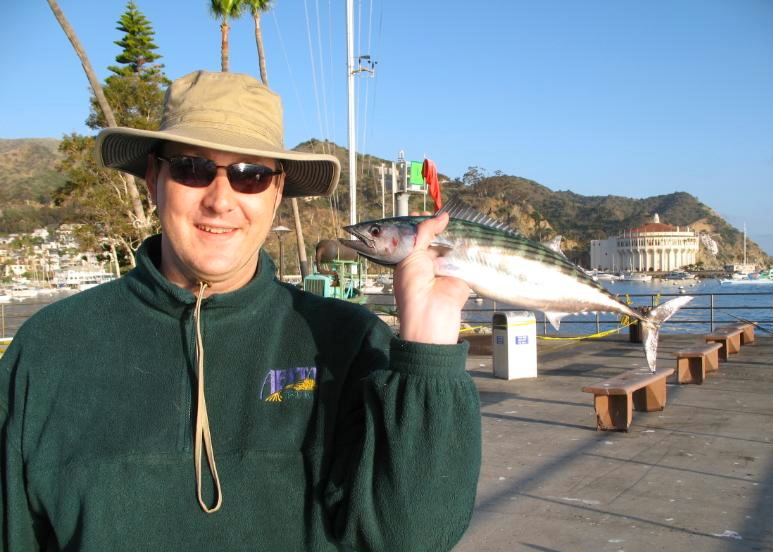 We jigged up some nice 8” Jack Mackerel and threw them in as live bait. I was first hit, on my Ugly 7’ Tiger with a Penn 965 spooled with 50lb PowerPro and a 50lb mono leader. The fish took two long smoking runs against max drag before breaking off the 50lb leader halfway up. 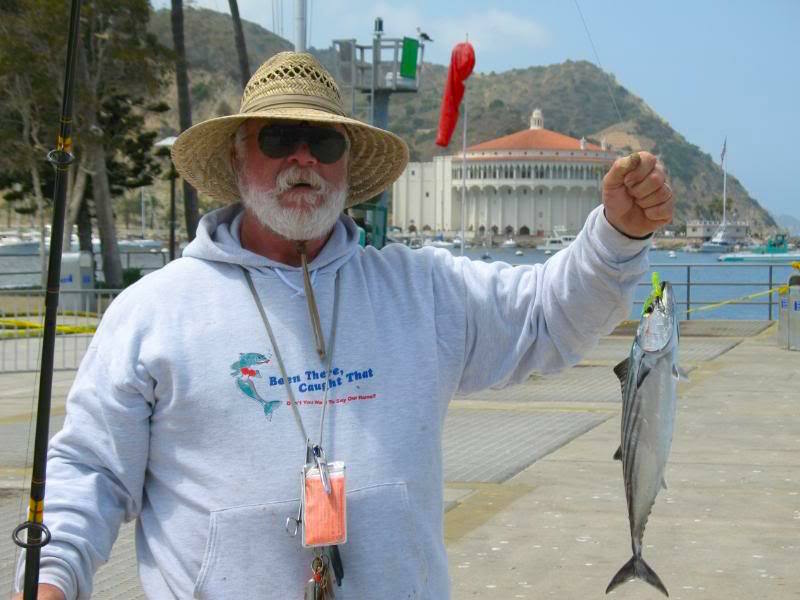 Steve-O was up next on a Jack Mackerel he had just tossed out. 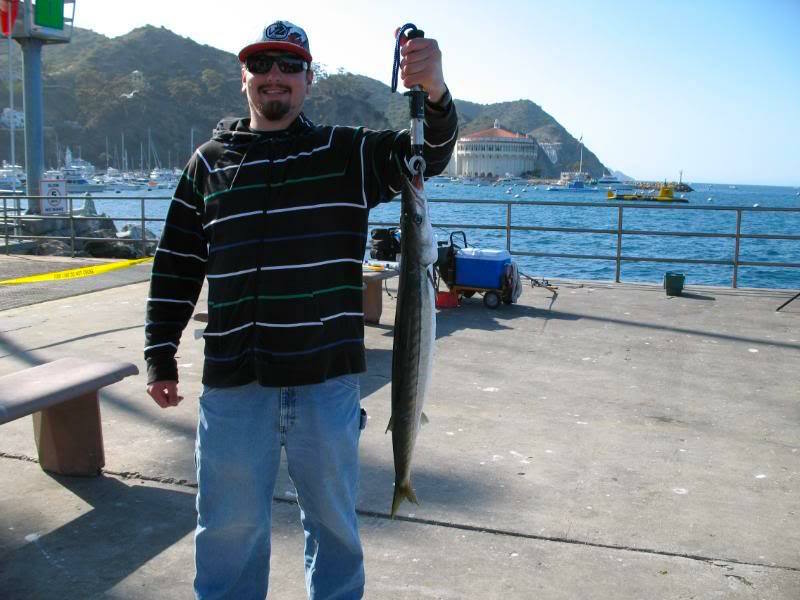 Steve was rigged with a 10ft MedHvy Ugly Stik with a Shimano BR6500 loaded with 65lb braid. 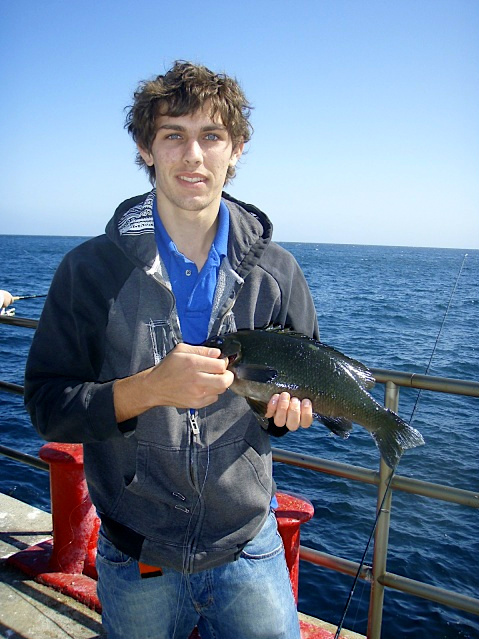 The fish took the bait slow, Steve set the hook, and the fish headed seaward at a steady rate. 5 minutes later and nearly spooled, Steve got the fish turned around, it came in very slowly, lots of pump and grind kept it moving in. Halfway back to the GPP, the fish broke off the 65lb mainline. Whatever it was, it was huge! We had a couple of small hits after that, before calling it quits and getting some much needed sleep at 1:30am. Sunday was a mellow day… we fished the Mole all day, picking off bonito at a steady pace, with the occasional mega-mackerel thrown in. We were the only fishermen out there most of the day. Capped off the day with another dinner at Antonio’s and decided to save ourselves for Monday’s fishing. Monday we slept in a little, but still hit the Mole by around 8:00am. Bonito were sporadic early but still present in good size and numbers. Early afternoon was epic! At some point, seemingly out of nowhere, the entire Lover’s Cove area lit up with a huge school of giant mackerel chasing smaller bait up against the beaches, and all of the associated Seagulls and Pelicans taking advantage of the situation. I wish I had my camera with me at the time, as it was incredible to watch. This continued for quite some time before the macs headed offshore a bit and the birds followed. 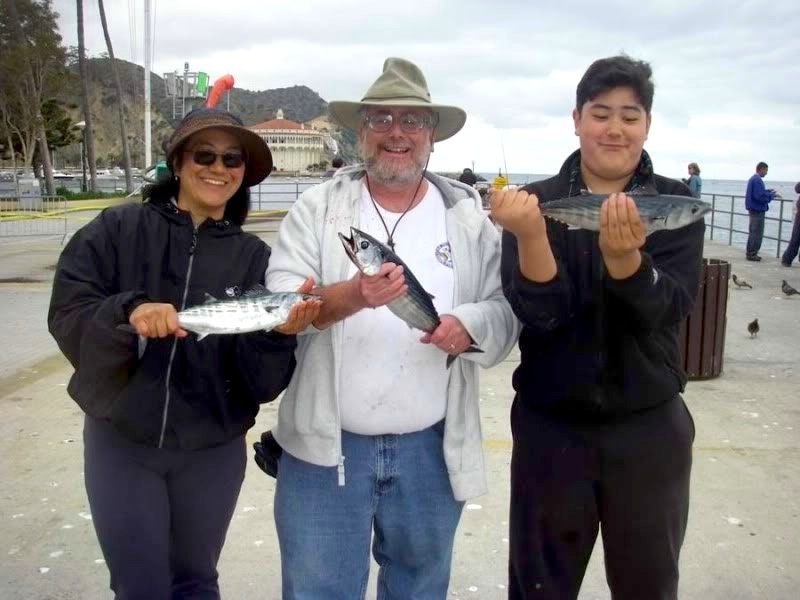 We caught more jumbo macs (16-19”) than we could count, with quite a few bonito mixed into the bunch. We also met a fisherman named Harold at the Mole Monday afternoon. He was on the island for a fishing day trip. This guy knew his stuff from top to bottom, and was an expert at fishing the Mole. He limited on big Opaleye, and caught two Calicos that were at least 4.5-5lbs (with a couple of other nice ones for a limit of Calico). He also had a heavy lever drag rig that was loaded with 150-lb braid. 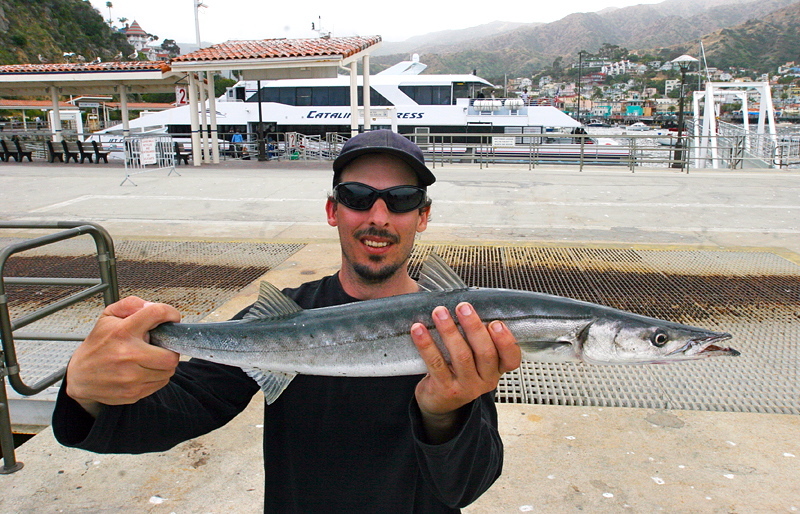 He threw a big 9” smelt on as live bait and threw it just past the kelp. 10 minutes later the smelt was picked up and the clicker started a slow deliberate crawl. 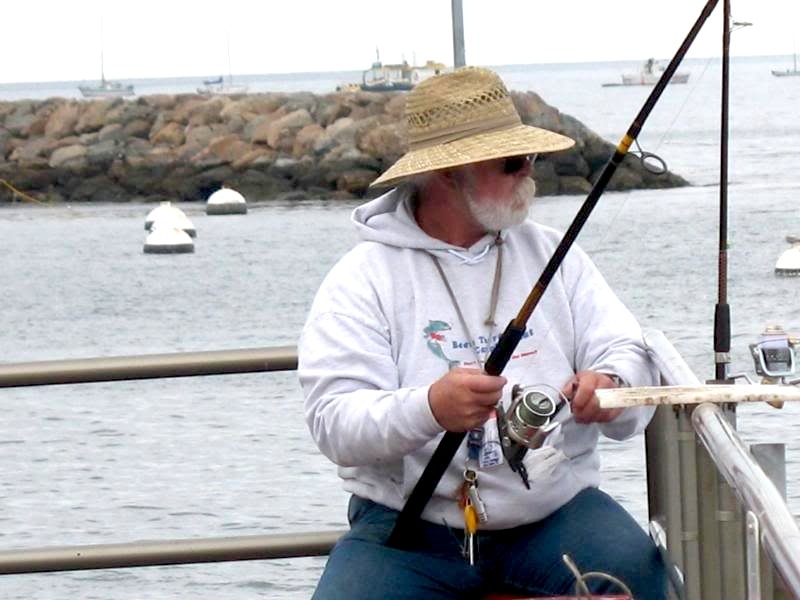 Harold waited patiently for about 12 seconds before setting the hook hard on the fish. 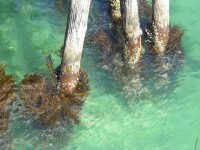 He was instantly pinned to the Mole railing by the fish surging out to sea!! 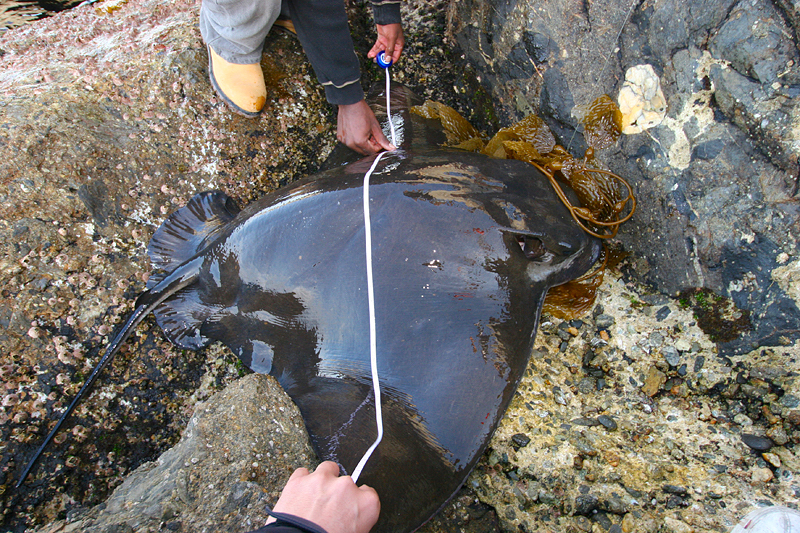 After a very long, dogged battle though the kelp, this MONSTER ray appears… in the water it looked bigger than it was, but we taped it at 58” or 59” wide with a massive head and body… Steve-O has the pics, which will be put up later… I had never personally seen one this big, and certainly had never seen anything that size landed through kelp like that!! The two huge calicos were also very impressive fish! We fished Monday to the point of exhaustion, and headed back to the hotel. We stopped by the GPP and found it was closed off at the end again, so our plan for night fishing there was cancelled, and we decided on a good night’s sleep instead after a final dinner at Antonio’s. Woke up, finished packing and checked out for our 8:00am departure. Arrived at the Mole and realized we had no time left to fish, so we snapped a couple of pics and jumped on the ferry home. 28 hours 4 shuttles and 4 flights later I arrived on my front doorstep… Long story short we had mechanical failure in Phoenix that kept us on the runway for 1.5 hours, causing me to miss my connection in Denver, resulting in a free hotel room in Aurora, Colorado, followed by two more flights (Denver–>Charlotte, Charlotte–>New Orleans), My luggage came in on the wrong airline so I had to go through hell to find and claim it…. Woo Hoo!! I was so exhausted when I got home yesterday, but I promised my wife I would take all the baby feedings, so STILL no sleep for me, and I’m back at work already…. 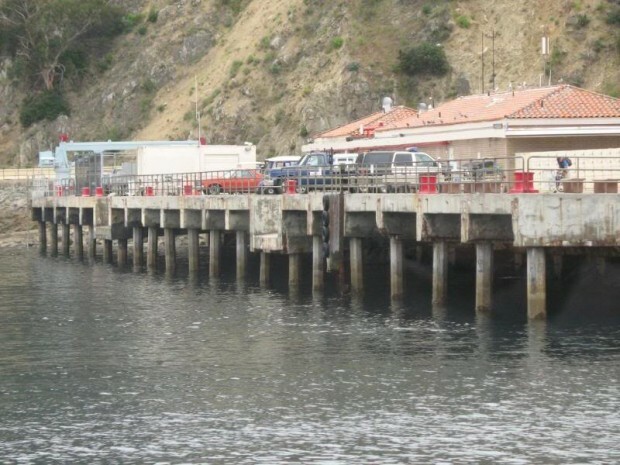 My dad and I drove down Friday and arrived at the ferry terminal at about 5:00pm. 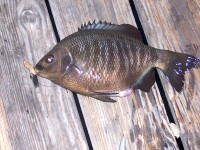 I fished a while around the ferry terminal with jigs and missed two hits and saw a guy catch some undersized sand bass. We got on the ferry at 7:00pm and arrived at the island just after 8:00pm. 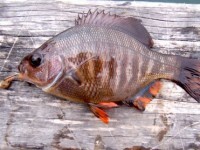 To my surprise there were still many garibaldi under the docks. We stopped at the hotel and my dad went to bed and I came out to the Pleasure Pier at about 8:45 pm. I started catching calicos one after another using jigs as soon as I got there. 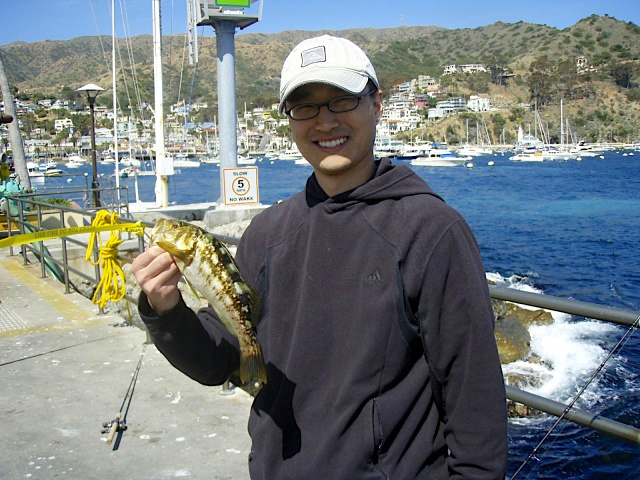 within the first 45 minutes I caught at least 10-15 with two about 12″ and one at 14.” After that the calico bite slowed down a bit and a few others joined me. I ended up catching a total of 27 calicos and a scorpionfish. 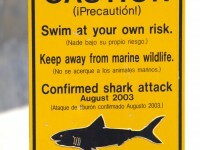 I also saw some big fish that started surfacing just after midnight. I stared getting these soft hits on my big rod and then around 1:30 am I finally hooked one, I took off running and I could feel head shakes. It was not a bat ray, it jumped a couple times a couple hundred yards out then broke off. I ended up leaving around 2:00. I got up around 6:00am on Saturday and was at the Mole by 6:45 am. I set up on the corner and started catching calicos and small opaleye on peas, then around 8:00 the wind picked up and I moved down to another spot. 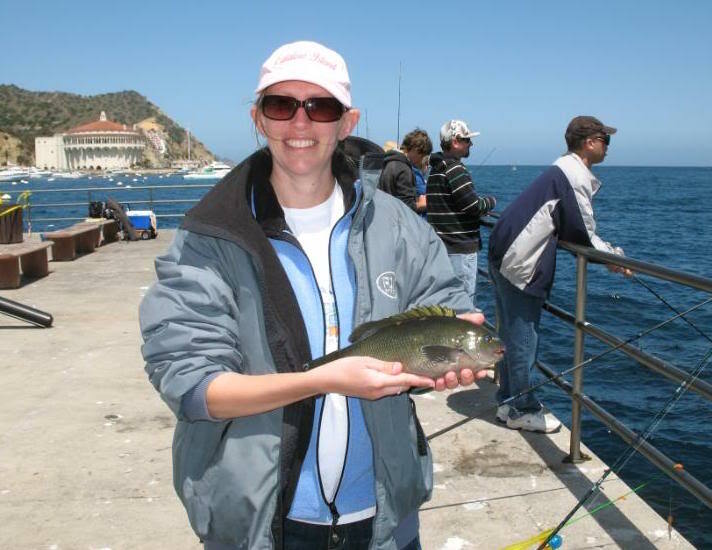 There I started catching lots of fish on peas including opaleye, calicos, smelt, sheephead, mackerel, halfmoon, blacksmith and wrasse. 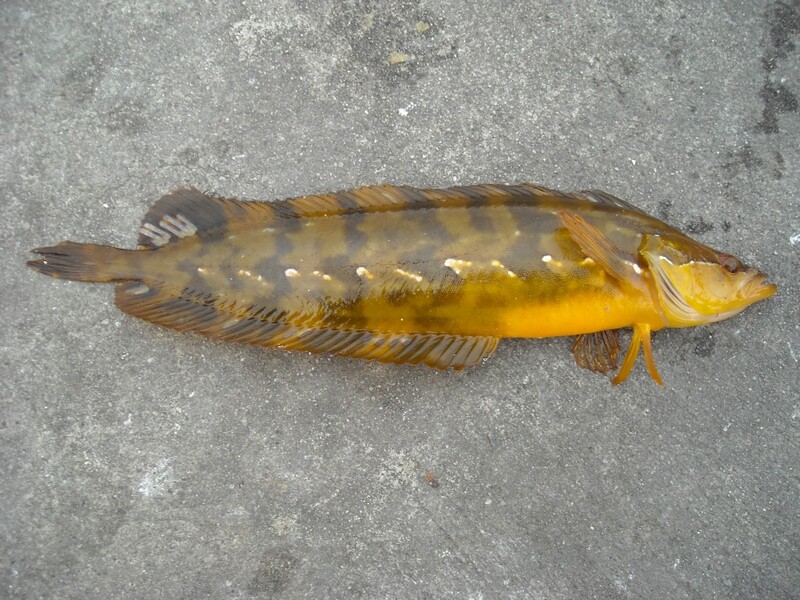 After the derby started I continued my method of fishing for opaleye with peas and caught a few opaleye in the derby along with many other fish all caught free-lining a single pea with 4-lb fluorocarbon. 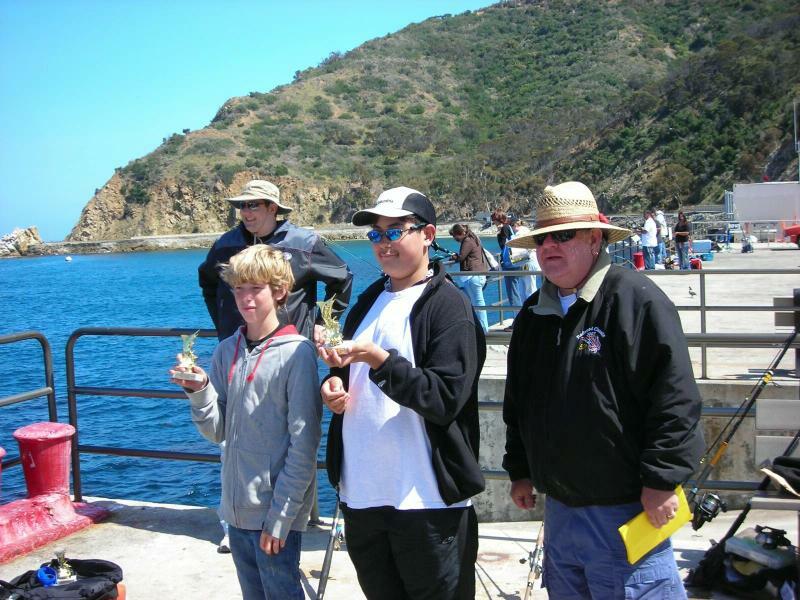 That method came through for me and I ended up getting second place overall and the award for the most fish. I moved back to the corner and continued catching macks and opaleye. 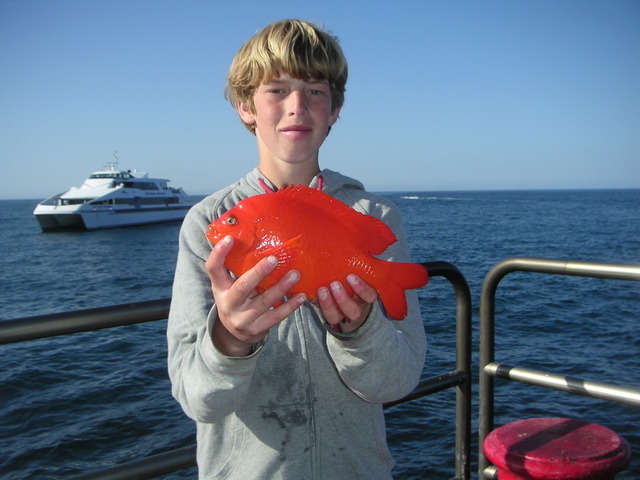 Then I caught a nice garibaldi about a pound on free-line ghost shrimp. A little while later I caught a nice opaleye about 2lbs. I caught a few more fish before we caught are ferry at 7:30pm. We ended up driving all night to get to the Sierras to fish for trout. We stopped a few times and got to our first spot around 7:00am. We fished all day and I ended up; spending a lot of time stalking some suckerfish that were very difficult to catch. I ended up catching five of them up two about 2-lbs and eight trout all around 2-lbs. The suckerfish fought real hard and I could not get the to hit on 6-lb line and had to change to 4-lb fluorocarbon, they fought like carp and jumped when hooked. 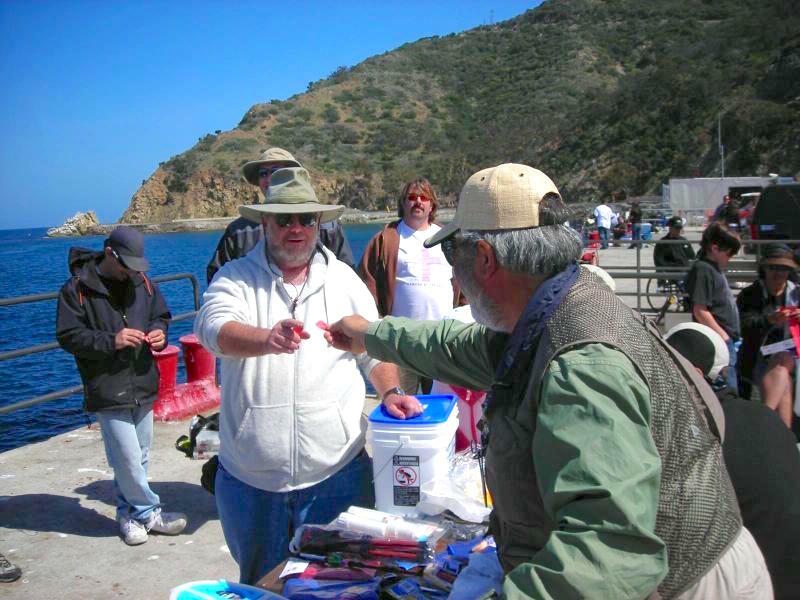 FIRST Catalina Get Together, FIRST time fishing on island, many new FIRST time species caught, and the best FIRST was meeting many new friends/anglers, (as well as renewing ties to dear friends). 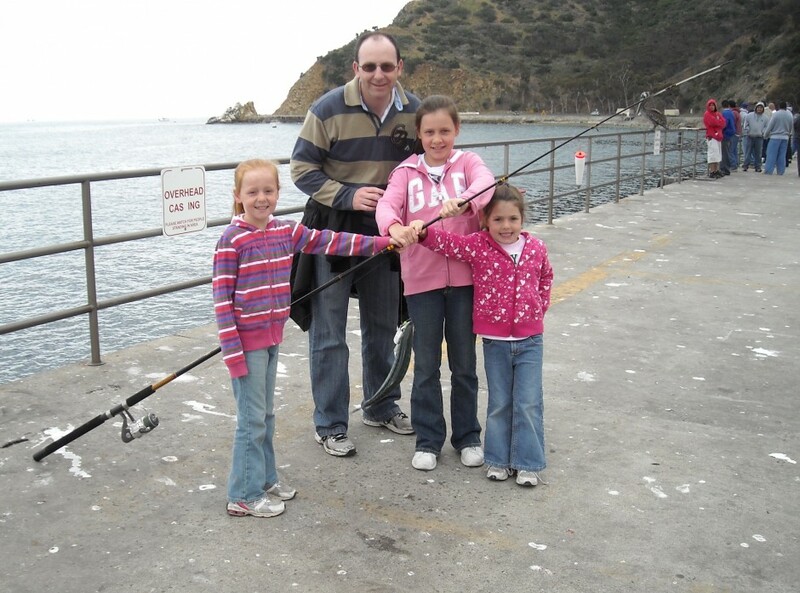 Highlight of my trip was having a dad and three young daughters work together and reel in a decent Bonito (near right knee of girl in middle of pic). I had just hooked off the Mole. 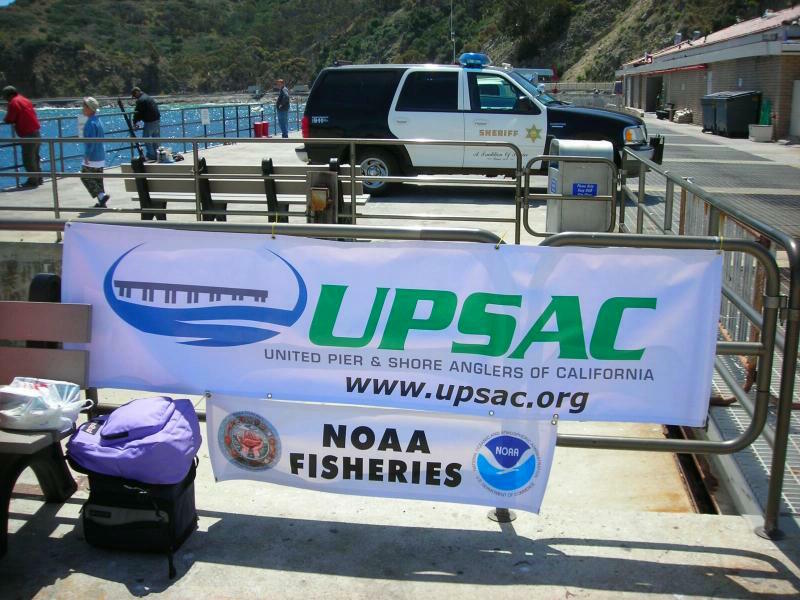 They were visiting from Australia and were watching us fish while waiting for boat to mainland, gave him my UPSAC business card and told him to E-me and I’d send them a pic. Great food, great friends, great time. Kudos to Hashem for all his hard work in setting up and coordinating the overall event. Thanks to all the folks who, worked, donated time/food/prizes/money, made suggestions, shared a meal/drink/laugh/conversation, and just being there. Whew! Still unwinding from trip. Talk about your getting back to the REAL WORLD shock. Alright, so my report: I played hooky from work so my girlfriend and I could catch the 2 pm ferry from Long Beach on Friday. While waiting I spotted the only other two people carrying rod cases, with a suspicion they were pier rats. Once we got in line, my suspicions were confirmed, and I met scooterfish and steve-o for the first time. After a couple rum and cokes, (sorry, I’m bad with time…) the ferry reached the Mole. 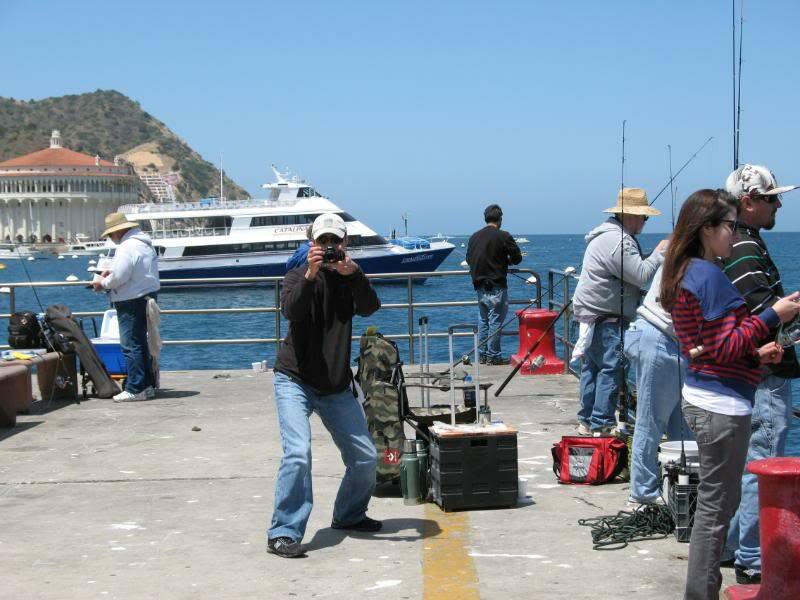 As tempting as it was to just start fishing, I decided to check in first (I didn’t want to have to unpack all my gear out on the pier) before heading down to Vons for some frozen shrimp and peas before going to check out the fishing. 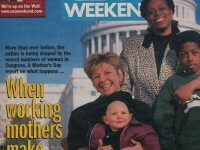 I’m guessing by then it was sometime around 5.. 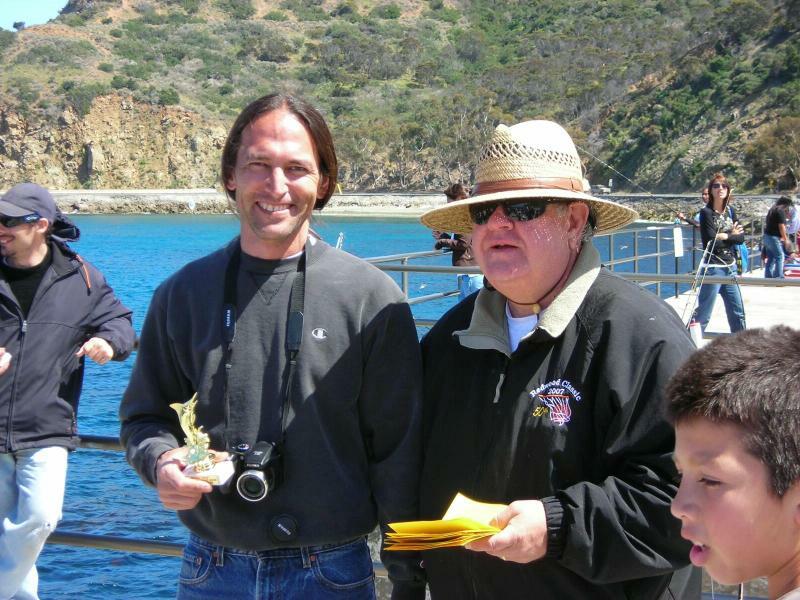 I settled into a spot near the corner where scooterfish and steve-o had set up casting for bonito and met Mahigeer who wasn’t too far away, and soon after met Gordo and Santa, and later Mr. Ken Jones himself. I met a few more forum members that night, but at the moment I can’t recall who I met on Friday and who I met at the derby. (hint: too many margaritas that night) but I’m pretty sure I met everyone there before it was over. The water quality was incredible — my photos can’t do it justice. 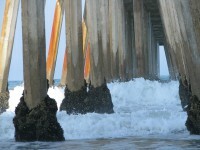 There was only a mild swell and so I decided to set up a high-low and drop straight down between the pilings. My bait was stripped many times until I figured out just the right size to cut it for it not to be stripped — the peas were just hit or miss. My first catch was a seniorita — unfortunately it had somehow been foul hooked deeply through the side… Not a nice way to start the trip. 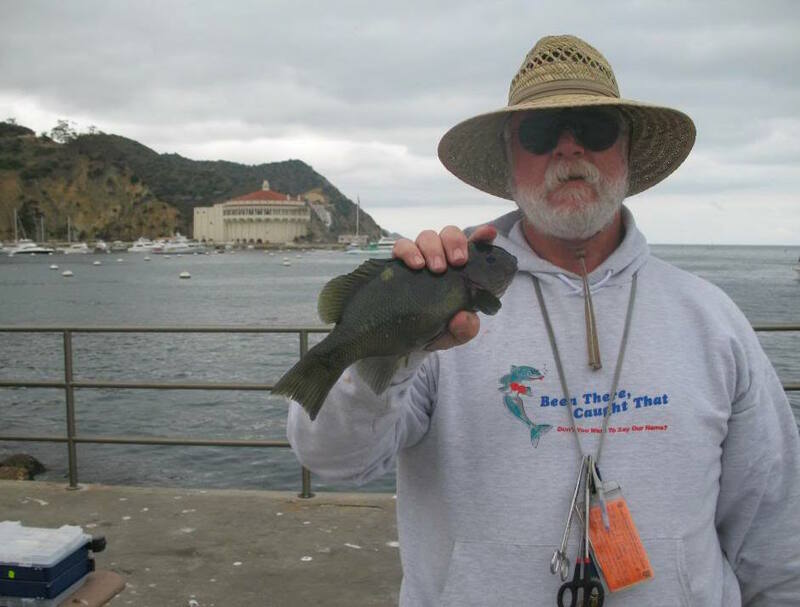 A few minutes later I picked up a decent-sized (about 6 inches) blacksmith perch, followed by another seniorita and a nice sized garibaldi (6-7 inches, but fat. 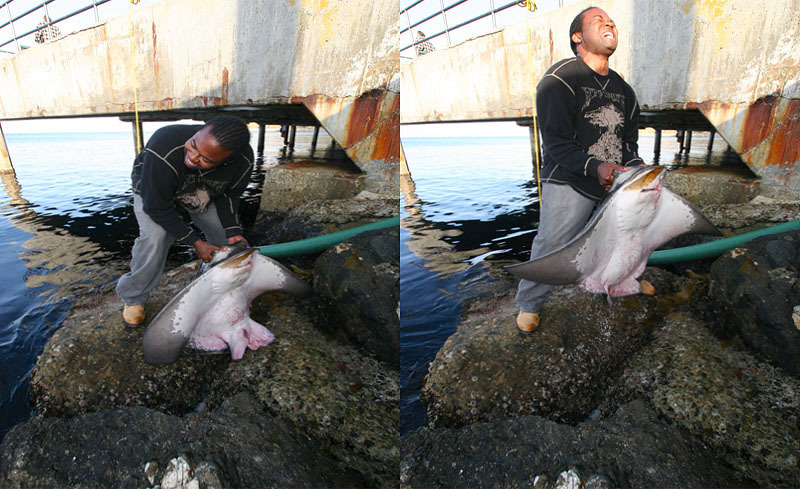 ), which was promptly returned to the water. I was using an 8′ ugly stick 8-20-lb. for those hookups, with spinning reel outfitted with 20-lb. braid, and 8-lb.-15-lb. leader, varying between high-low and single surgeons loop. 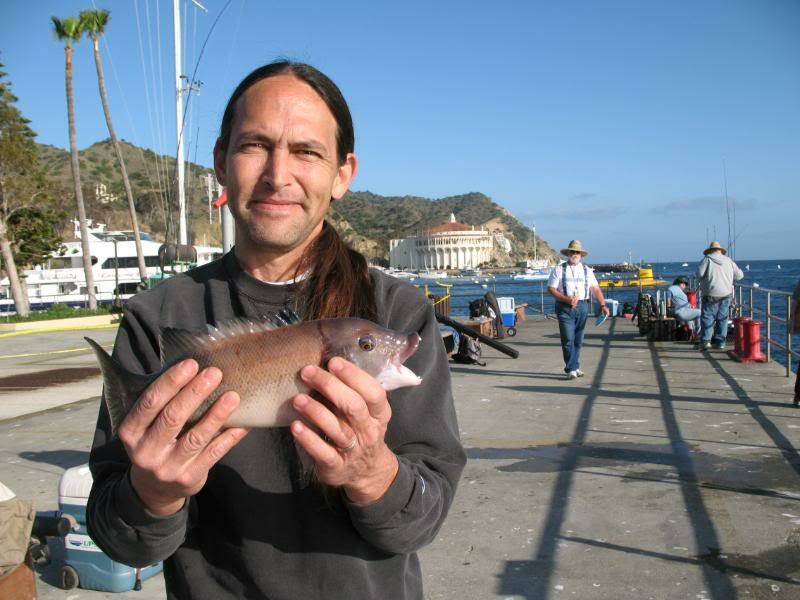 My bait continued to be stripped for some time before I hooked up with another garibaldi — again it was promptly returned. For a change, I was busy spending more time talking with the people around me than paying attention to my rod, and so I lost a few hook ups after. I decided to switch to my Sabiki rig while the others were getting their gear packed up to get ready for the dinner. I was using a 20 dollar 5′ Ugly Stik kit with 6-lb braid, and a size 12 circle hook Sabiki. Jigging produced nothing, so I switched to a 1 oz weight and tried my luck casting. 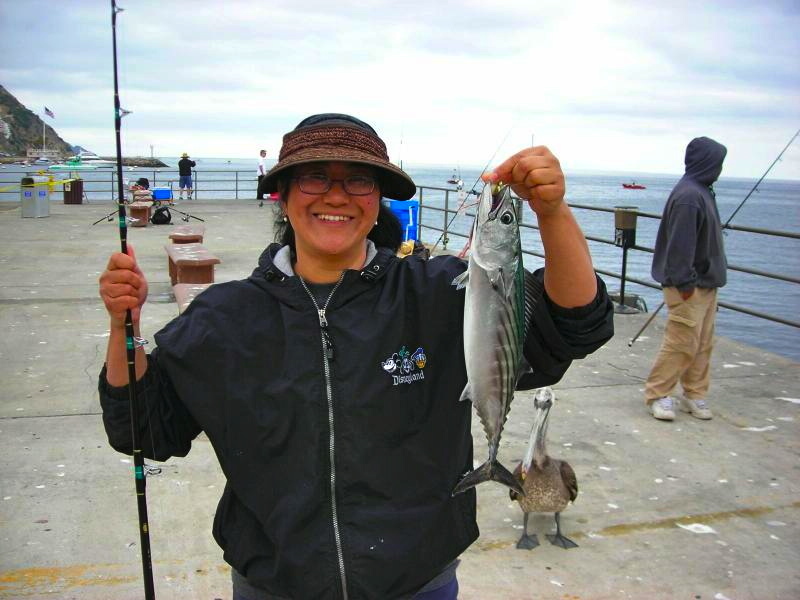 Immediately I began to hook up with small jack mackerel and a few good-sized Pacific mackerel, keeping a handful of them for bait. Once it got dark, I packed it up to go to dinner myself. I came down to the mole later, with some glow sticks and bait hoping to hit some more mackerel, but, no takers for two hours before I gave up and went back to my room at the Hermosa Hotel. Saturday morning I hit the Mole a couple hours before the derby was to begin, and took up the same spot near the bait board between where Hashem had taken up residence, and the corner that Scott and Steve-O were sharing… which happened to end up directly in front of the lunch/raffle table. 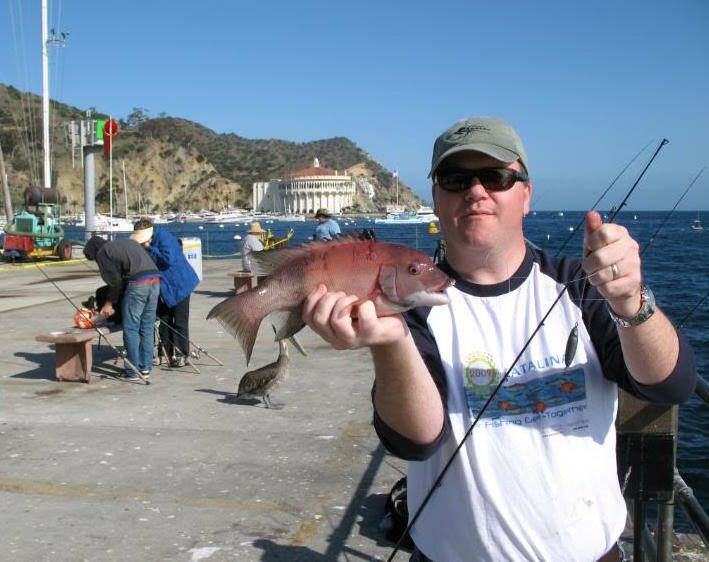 My luck before the derby was just decent — a couple jack mackerel, my first calico, a little 4-5 inch thing, and a garibaldi. 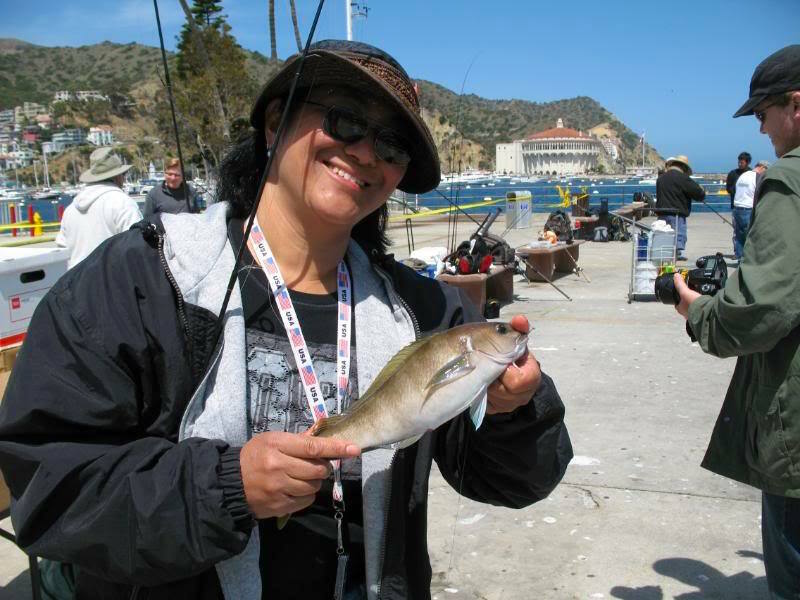 During the derby I didn’t do much better — a seniorita, a jack mackerel, and another, smaller calico if I remember right. Scooterfish and Steve-O were slaying the Bonito, and I spent more time just enjoying watching their battles over paying attention to my own line, making for some good photos. 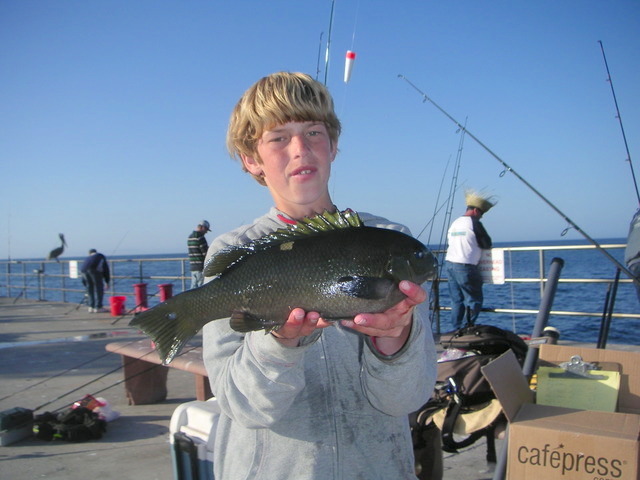 I remember seeing a massive sheephead pulled up, and a nice barracuda being landed, and watching G-Dude wrestle in some nice bonito of his own. 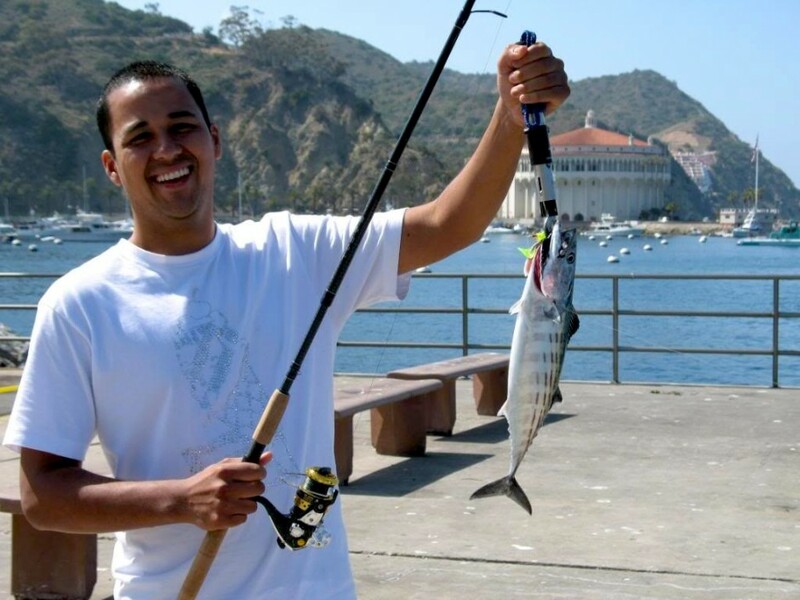 Some kid and his dad were trolling in a boat, and everyone enjoyed the show as a kid landed a 32-inch or so barracuda out in the area where the bonito were being caught from. Lunch was great, and Gyozadude’s potstickers were incredibly good. After the derby, the winners received their trophies, and a few goody bags were handed out. I won a few small prizes at the raffle — a couple towel clips, some tackle, some nice lead-free split shot that I later put to good use.. After all the other prizes had been awarded, the big draw came up; most of the numbers pulled had been much higher than mine, and the competition was pretty fierce. it must have just been beginners luck, because the final ticket just barely fell into the low end of my spread… I’ll post a couple close ups of the details on the rod, it’s a piece of art. yet another thanks to G-dude for donating it, and the Daiwa Excel reel he paired it with. I had gotten pretty sunburned after my girlfriend had borrowed my jacket against the wind (the swells were like a washing machine, snags were unavoidable, though I only lost 6 hooks and 3 sinkers including a “snag free” sinker) so I decided to head back to my room to rest and recover, as well as to safely stow the new rod, despite the temptation to use my spooled light reel on it for the time being. 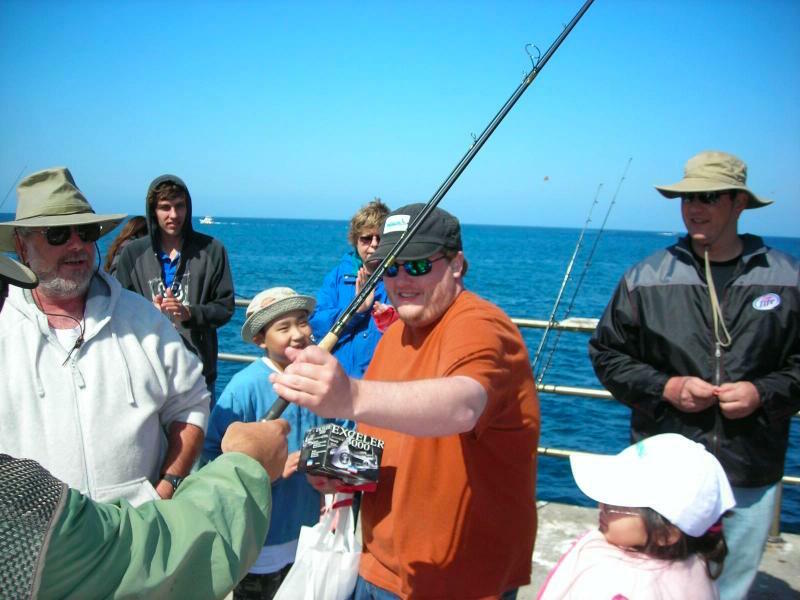 (after watching and hearing Scotts rod break, I had bad visions in my head…) After a late second lunch with my girlfriend, I returned to the mole for some late afternoon fishing with Scott, Steve-O, Hashem, and Ross, and got to chatting with Adam and Rebecca. Towards sunset as everyone began to pack up, I decided to toy around with my cheapo 5′ rod again, and sure enough began picking up mackerel. I had decided because of the time I was only going to cast as long as they were biting, or until I caught a dozen… that only took me 7 casts, and so I managed to catch up with everyone else on the way back to the hotel. My girlfriend had received some tough news regarding a family emergency and wanted some alone time so I tagged along to dinner at Antonio’s with Hashem, Ross, Mike, Adam and Rebecca, for some good food and better conversations. The dinner was a blast, and lasted til long after they had stopped seating customers. I decided to call it a night and rest my back and legs rather than night fishing and on the way back Hashem received a text regarding horn sharks at the Green Pleasure Pier if I recall correctly, which tempted me, but with my sunburn sleep beckoned. I woke up early, and went down to the Green Pleasure Pier Sunday morning around 6:30 to get some photos, where I found Mr. Jones in the corner with his lines out. After getting some photos of the casino and the harbor, I retreated to let him fish in the morning peace. The crowds were still in their hotel rooms, and the bay was still and quiet, perfect for photos and fishing. I made my way out to the Mole to get more photos before returning to my room. My girlfriend and I decided to pack early to get it done with, and so I only left my 5′ rod out, with one of my mini-trays with artificial baits and that Sabiki that had been working wonders. Leaving our gear in the room, I took the rod with just a 2-inch pumpkin seed grub on a 1/16th oz jig head, and my girlfriend and I walked down to the pier. 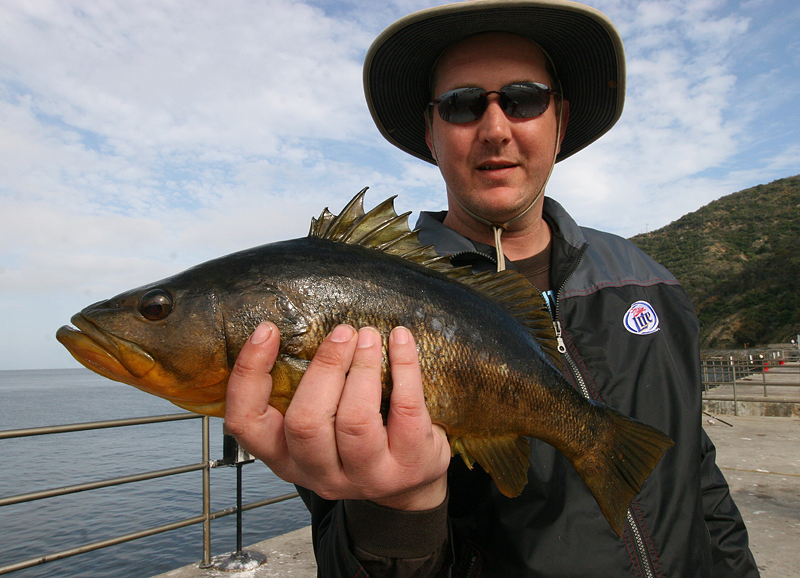 I tried jigging it a couple times, nothing, so I cast out as far as I could underhand with such a light jig, not far. I let it sink for a couple minutes until I guessed it had reached bottom, and began a slow retrieve. I got a couple nibbles the first couple casts, then nothing. I promise my girlfriend one last cast and of course then I catch my first fish from Green Pleasure Pier, a 7 inch or so calico. After returning to the room to store my gear, we ran into Mr. Jones on the way out and I heard about some bat rays he’d hooked up with that morning. My girlfriend wanted some food, but it was still a couple hours before the breakfast the others had invited me to, and so I indulged her, deciding that I would go to the other breakfast at 9 am anyways… I got back to my room around 8, and returned to the Green Pleasure Pier thinking I’d just get a couple casts in. After a couple more small calicos I realized it was already well past 9 and that I’d likely missed the breakfast. We got our gear and decided to head to the mole, just in time to see Adam, Rebecca and Ross about to get on the ferry before I could exchange any words—unfortunately. I set up beside scooterfish, steve-o, mahigeer and santa and proceeded to get skunked at the Mole while waiting for the ferry. 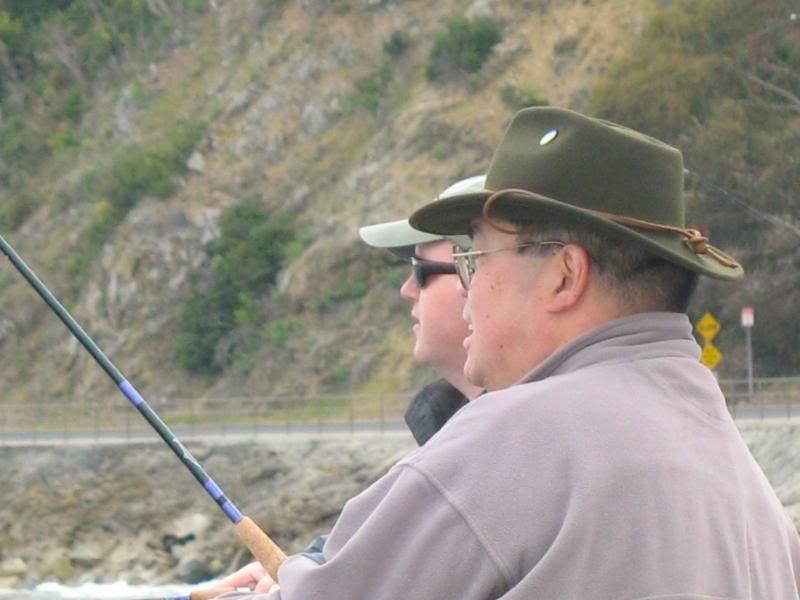 A big thanks to Mike for rigging up a strap for my wide brimmed hat , without it I would have had to retreat to the benches in the shade, rather than being able to enjoy everyone’s great company while waiting for the ferry, even if I did get skunked. 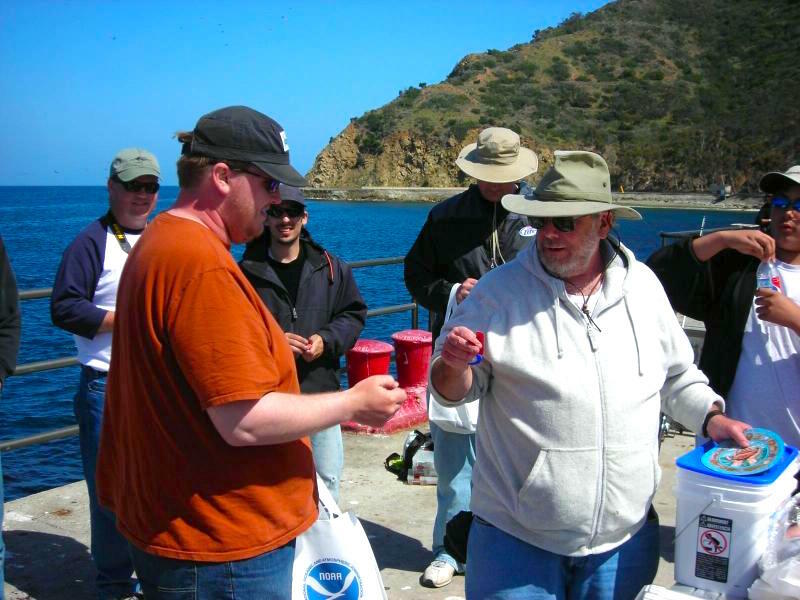 I sure hope I can make it to the get together next year, whatever happens I know the next time I head to Catalina, I’m arming myself with those launcher floats and heavier gear so I can target those Bonito myself! So much to report, but sooooo Tired … with a capital T. Smile It was a great time to fish with all of you and what fishing it was! 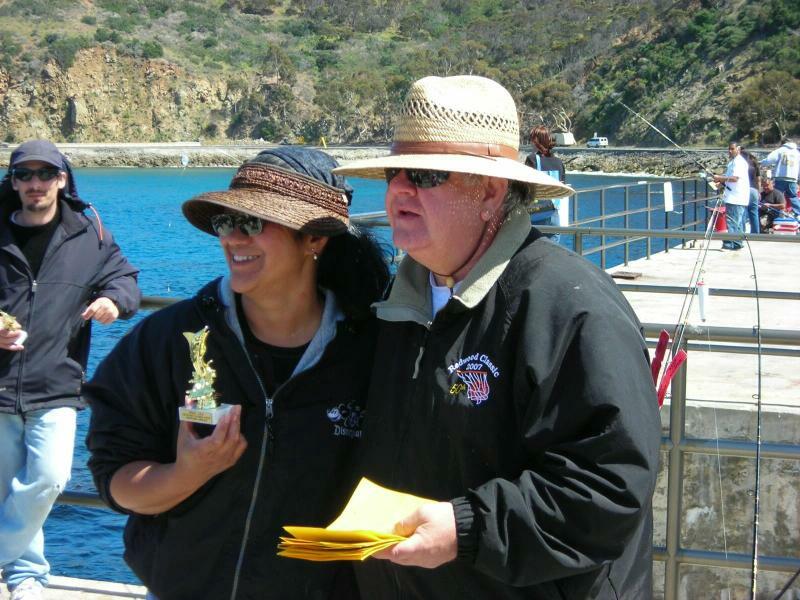 Perhaps the best bonito fishing of any year I’ve attended was Scooterfish’s opinion and I have to agree. We really hooked up this year and my arms, back, legs are slow, cramped and burning as proof. More to come as I process the images. 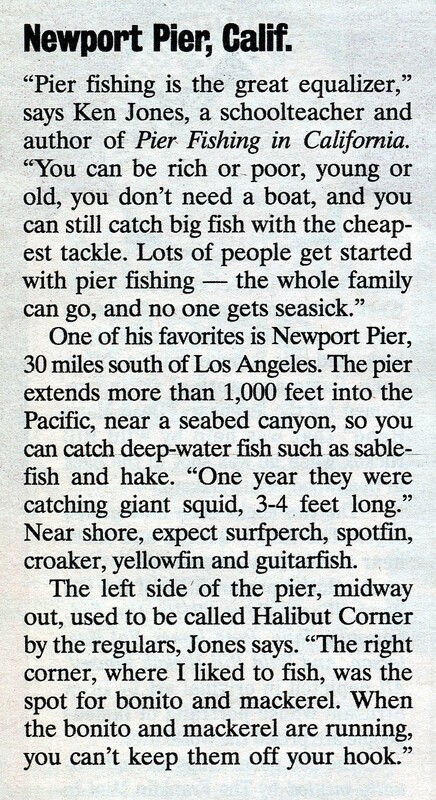 Posted in Daily musings... and tagged with Avalon, Barracuda, Bonito, cabrillo mole, California piers, Green Pleasure Pier, Kelp Bass, Opale, Pacific Barracuda, Pacific bonito, Pier Fishing in California, pierfishing, saltwater fish, saltwater fishing, sheephead. RSS 2.0 feed.